Facing an interesting decision about mixing my personal and professional online personas. I think I need to establish a “professional” ID. 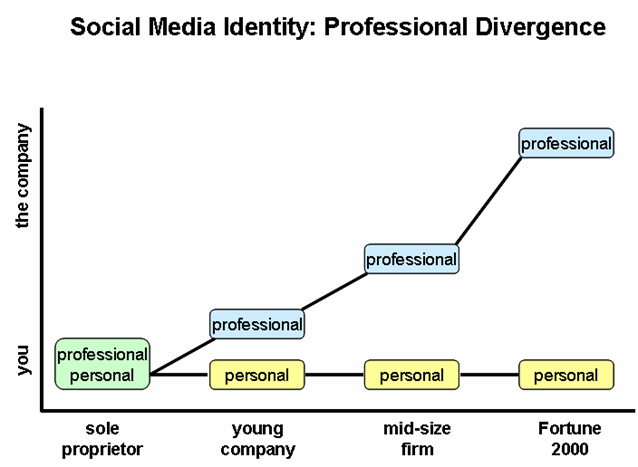 When it comes to developing professional identity in social media, a key consideration is the size of your company. The graph below depicts where the professional and personal identities diverge. The idea in the above chart is that the smaller the company, the more closely your personal and professional identities are tied. As the company size increases, the more separate your identities become. Where can these identities come into play? For entrepreneurs, your social media interactions are your marketing. How you think. What you care about. What insights you can deliver. And employees of small companies are the company. So their identities are very closely tied to the company. Twitter: Sam mixes a heavy dose of Jive-related tweets with interesting tweets on other subjects. He ain’t afraid to keep it real out on Twitter. Go Big Always: This is his personal blog, covering the social and enterprise software market. Jive gets plenty of attention, but it’s not the focus of every post. JiveTalks: The official company blog. Sam can be found here, and the posts are product-related. Up until now, I’ve been blogging on JiveTalks. But a corporate blog is just that – a corporate blog. I wanted to have a place where I could more freely voice wider observations and thoughts beyond Social Productivity and Jive’s business. That being said, you get Sam, you get Jive Software. Employees working for larger companies will tend to have separate professional and personal social media identities. It’s tempting to say there’s the the “authentic” you and the “corporate” you. I think that oversimplifies things. The work you do is part of your authentic identity – if it wasn’t, presumably you’d quit the job. The separation between personal identity and professional identity is the greatest for employees of large corporates. Whereas Sam Lawrence’s social media identity is very much a personal and professional combination, I decided to create a second identity for engaging social media professionally. My handle became Hutch@[company name]. You see that, you know I’m doing things on behalf of my company. There’s a notion that someday all of our social media identities will be blurred. “Your personal identity is your professional identity in Web 2.0.” If we’re talking “professional” in terms of your career and talents you can bring to a company, then yes, that statement is true regardless of where you work. However, if “professional” is the identity you assume on behalf of your company, then that statement really only applies to employees of small companies. For employees of big corporates, managing your social media identities is more complex than that. I think it is very hard to separate your personal persona from your professional persona. As you point out, they are not mutually exclusive. You can be personal and professional at the same time. In fact, since everything is findable in the Web2.0, including by your co-workers and boss, you should always be professional. In some sites you can be more free-wheeling and in other sites you should be more buttoned-down. I think having two separate personas will only get you in trouble. I agree that you should not use your work email or company name. After-all what happens if you leave that job, all that activity and goodwill goes away. @Doug – great thoughts. I understand your point about findability. If I know you’re an employee of a company and I find your personal posts elsewhere, what does that say about the company? But I really do think they’re separate worlds in most cases. I come at this from the online persona perspective – what do readers think about when they see your name out there? Are you the guy giving straight talk about the strengths and weaknesses of an app? Or the guy trying to convince me to buy your product? I also was coming from the position of having established a personal identity (e.g. through this blog), then having to graft on a separate identity for work. The word “professional” has several meanings. The one to which you allude is not so much the skills you possess or things you do on behalf of your company, but the way you conduct yourself with others. I agree that you should be professional, with some latitude for self-expression. BTW – I’ve been a subscriber to your blog for a while. Really enjoy it! I’m honored you included me in this post. It’s really interesting. I can see truth in the need to peel away personal/work identities the larger you become. I think we’ve yet to see a company go through the whole maturation process but my hope is that the right side of the grid can be less distanced and, more importantly, that the honesty of voice and interaction with the community doesn’t whitewash. is really interesting. He talks about individuals “individuals impersonating the corporation”. In some ways I think this is true, but then who should twitter on a corporate level, or should anyone? Should it just be name@companyname always, as opposed to companyname on Twitter? Part of the splitting of personal and professional is deciding which to use in which venue. As Sam pointed out he has two separate blogs, each with a different voice and probably different audiences. I have a split since I have two roles: knowledge management attorney and real estate attorney. As a result I have two separate blogs. My first thought was to combine them together (the “space” in KM Space derives from the real estate side). I found it confusing to have the two different sides with really two different audiences. But common social sites like facebook, it is just me and different facets come out. But I get to control that audience. As for twitter, I would find it confusing to have different accounts. I think you just have to “keep it real” in twitter. It short doses that do less damage, but keep it professional. 1. Employees who discuss their work through less-corporate channels like twitter have the opportunity to demonstrate their companies’ thought leadership in the industry. Of course, obvious risks abound, but I trust myself to be responsible and represent well. 3. It’s just not straightforward to split my personal and professional identities, as you point out. A lot of my personal contacts, eg. friends from college and business school, also work in the industry. Etc., etc. This is a hot topic for my team at work. They’ll love your chart. @Sam – I am looking forward to a true integration of the personal and the professional. As Jive grows, you’ve set the foundation for that. It will be hard for the established, decades-old companies to think this way. @Richard – really interesting thought about whether to include name@companyname or just companyname. My initial reaction is that just using companyname immediately devalues any comments there. Readers will think, “oh, that’s the PR-pumping identity”. Part of the problem is that just the company name by itself brings existing brand into it. and the existing brand may have no ‘cred’ in social media. There are companies that probably would have credibility immediately – e-tailer Kartmaloop might have that, for instance. Thanks for that link – really good thinking there. @Doug – you hit on something important there. You develop a following in social media, one that comes to expect certain information and opinion from you. Knowledge management and real estate are so different that it’d be hard to reconcile your audiences. Also, getting out of straight “sell” mode is key to establishing a more credible professional social media identity. Hi Hutch, thought provoking post on a interesting topic, thanks! This has definitely been on my mind as I further develop an online presence for myself. I also like what Doug has to say, as I do believe that each ‘channel’ we’re operating in has different and changing rules about what is appropriate, and we’re learning as we go. I work in a big corporation, but I have somewhat of a unique personal brand as the lone anthropologist. For me, that identity is part of my unique value proposition. My challenge, then, is to operate at both ends of your spectrum simultaneously – working in a large corporate context while not losing sight of what makes me unique for outside projects, consulting work, etc. I think that may be a slightly different set of issues than someone who tweets on their company’s behalf … but maybe not. One of the ways that I’ve looked at this in my own research is through the notion of branding. In 1997, Tom Peters wrote an article entitled The Brand Called You (http://www.fastcompany.com/magazine/10/brandyou.html), in which he argues that individuals have to retain a sense of themselves and their own brand, since that brand is what remains constant as alliances and companies change. All that said, I think that the variables which affect your public versus private decisions is likely more complex than the size of the company you work in, though I would agree with you that the balancing act is more complex as you have more identities and interests to juggle. This is a brilliant post! Thanks for including me in the conversation 🙂 I really like your ‘evolution’ chart. You’re absolutely right on. In startups, if you’re the entrepreneur, your personal brand defines the company culture, so the lines are blurred. If you’re the CEO of a large corporation, it’s hard to keep anything ‘personal’. I work for a large corporation and I never blog about (or mention) my employer because a) it’s my personal blog and 2) there are obvious liability issues. So I prefer to keep my professional and personal identities separate. I think your decision should be guided by size of your company, your role in that company, and most importantly, your objective for going ‘social’. You can leverage social sites to evangelize your company/product or to connect with friends. Your intent should drive your decision on which identity to use and when. @Natalie – great comments there. You note at the end that the factors affecting professional vs. personal online personas are more complex than company size. I agree. Industry type comes to mind as a another factor. Sectors that have much more of a human face to them – consulting, advertising – seems ideal for a closer blend of identities. Company culture is important – I’m sure there are small companies where employees wouldn’t feel comfortable mixing their social media identities. @Mia – Good to hear I’m not alone on this thought. I like your notion of asking, “what’s you objective for going ‘social’?” Thinking through that answer helps figure who you will “be” when you engage online. Im a small business owner myself and i completely agree with you there. Also it helps if small business owner can collaborate their personal and professional interactions and also systemize them. This can help drive synergy (with teams) and also aid goal achievement. For a while i have been developing a product called Deskaway . It helps companies systemize their processes by the use of various tools. Do review it if you can, check it out and let me know what you think! A version that’s free to use is available! Also i’d love to know your thoughts with respect to systemization of marketing across social media – and does it really help? Great post by the way – clearly outlines the intricacies of web 2.0 marketing. I enjoyed it thoroughly. Pingback: Lee Davies » Blog Archive » Personal and professional identity: dichotomy, trichotomy or multichotomous?